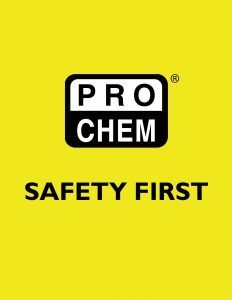 SURE PATCH | Pro Chem, Inc.
SURE PATCH is a 3-part system, consisting of an A component (the activator), B-component (the base) and C-component (white quartz filler). By themselves, they are stable and inactive, but when combined they create a chain reaction that transforms the mortar-like compound into a high strength, wear- and corrosion resistant coating. The repair kit itself is self-contained. It can also be kept on the workshop shelf for extended periods with no reduction in effectiveness. 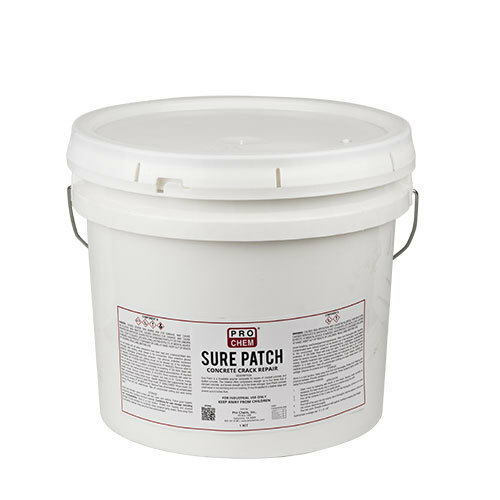 Unlike water-based products that only adhere to the roughness of the surface, SURE PATCH permeates into the pores of crumbling, cracked or split cement to form a high strength, watertight bond. Each 3.5-gallon container contains 1 quart of activator, 1 quart of base and 15 pounds of filler, paint stick and gloves. Clean crack by sweeping with broom or wire brush. Remove loose concrete as necessary. For best results, chip or chisel out a channel or groove along the crack. Remove contents from pail, put on plastic gloves. Pour all the contents of the 2 cans into the pail. Mix thoroughly until there is no color streaking. Pour half of the sand into mixture and blend thoroughly. Add the balance of the sand to mixture and blend thoroughly. Pour into crack. Smooth compound with plastic applicator, leveling to existing floor height. Place all tools, etc. in white tub and seal. Discard all remaining mixture and tools.